http://i.imgur.com/sRhUL.jpg - Here is an example of the idea from http://www.pixeljoint.com/p/2621.htm - Cure . 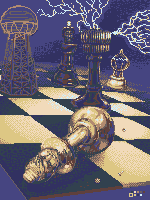 /pixels/poll.asp?id=1231' name='vote' target='_blank'>Vote now for your favorite pixelart in this week's challenge! 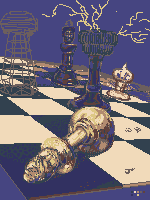 It's a greatly reduced and modified palette from this one drawing I saved to my computer years ago. 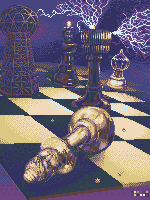 I don't remember what site it was from, but the original drawing has at least 256 colors. I changed at least 5-6, maybe 7, of those colors above so it also makes a nice, though not super smooth, greyscale ramp. Of course, if it's a bad thing to use any colors that are identical to a color from someone else then I could just adjust the rest of them too. Edit- I found the site, http://www1.odn.ne.jp/haccan/ - link , it's the first image on the front page.